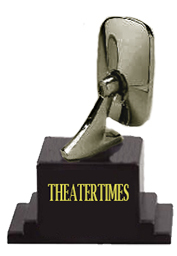 The number of quality productions attended by Theatertimes in 2008 was higher than usual, which made the 'Rearview' recognition process both easier and more enjoyable. It was a big year for attending musicals, and they were largely enjoyed. Not surprisingly, the Ahmanson Theatre, with its imported road shows and direct-from-New York reliables, led the field. 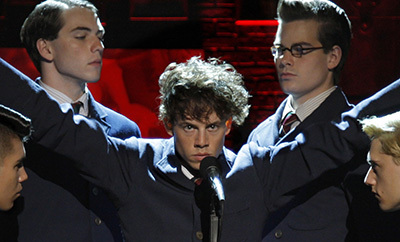 Because it was the most thrilling and envelop-pushing for me, Spring Awakening (above) gets top honors in the Musical category, but John Doyle's celebrated staging of Stephen Sondheim's Sweeney Todd was as exciting in its way, with actors performing the music on an array of instruments. However, that show had been covered extensively, and Sondheim is such a predictable entry that we salute Awakening's Steven Sater and Duncan Shiek. The other outstanding musical's do manage a mention in other categories: 9 to 5: the Musical took something that felt fairly unimaginative as a film and ramped up the creativity with Dolly Parton's songs and fine lead performances, all played out on a magnificent multi-location set designed by Scott Pask, who gets the nod in that category. Up there in the realm of thrilling and groundbreaking was Bloody Bloody Andrew Jackson at the Kirk Douglas Theatre. It is honored with favorite lighting for Jeff Croiter, which added greatly to the stylish mood of this piece. The Civilians also had a musical debut at Douglas, and with so much to commend their This Beautiful City, we tip the hat to the marvelous ensemble work. And the final musical to get honored by other means is Open Fist Theatre's revival of Joe's Garage. This was a revival and much more as it took what had only been a theatrical concept presented on a recording by composer Frank Zappa and brought it to life with the cooperation of the controlling, and now late Gail Zappa Credit to adapters Pat Towne and Michael Franco. For the acting Rearviews, a well-deserved nod to Julie White (right) for her hilariously brazen agent in Douglas Carter Beane's The Little Dog Laughed at the Douglas, the incredible Richard Kind as a hilariously brazen producer in Daniel Goldfarb's Adam Baum and the Jew Movie at the Hayworth Theatre, Tom Fitzpatrick as an unforgettable Fagin in A Noise Within's Charles Dickens' Oliver Twist, and the heartbreaking Diana Elizabeth Jordan in Julie Marie Myatt's powerful and important Someday for Cornerstone Theatre (presented at the Bootleg). And, last but far from least, are the premiere of Paul Oakley Stovall's As Much as You Can at Celebration Theatre. Seven years later, Stovall revisited the script and had a higher-profile production at the Mark Taper Forum, with Immediate Family. But the ingredients were all there, and successfully rendered back in 2008. The directing award goes to Ethan McSweeny for Stephen Drukman's In This Corner at The Old Globe. It just confirmed McSweeny's vision, which we'd seen the previous year at the Glove with A Body of Water and a few years earlier with Noah Haidle's Mr. Marmalade at South Coast Repertory, when I was still on staff. Speaking of which, a deserved nod to that theater's production staff for the imaginative renderings of Angela Balogh Calin's costumes for Doug Cooney's Imagine, one of SCR's Theatre for Young Audiences productions.